so they can rise above the stress of their lives and thrive. at short intervals throughout the day to strengthen the ability to direct focus, manage stress and regulate emotions. can help optimize brain function. We teach compassion for self and for others, both on and off the yoga mat. so that we can interact with and respond to the world in a favorable way---one that is in alignment with our own personal values. 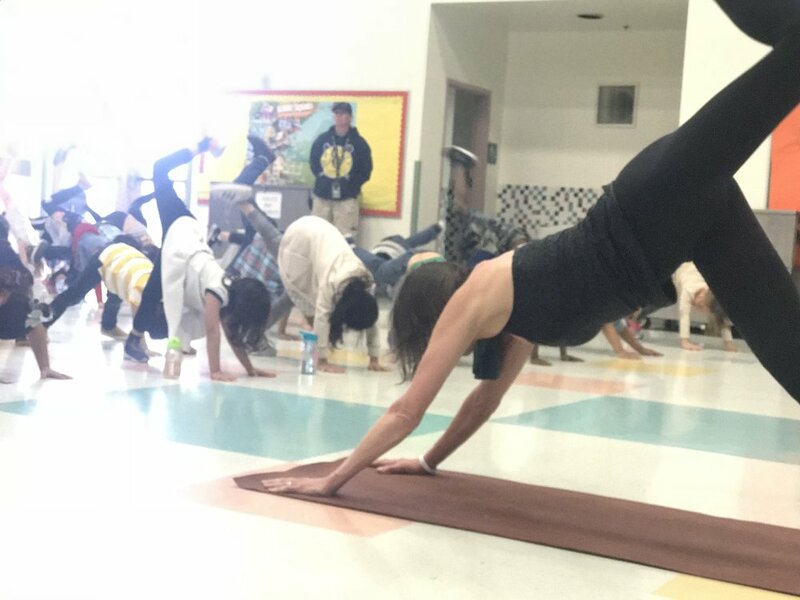 YoMIND seeks to add value to communities through teaching on site yoga, mindfulness and neuroscience classes in schools, to athletic teams and to our community's first responders. Additionally, YoMIND’s resource portal provides free, easy to use audio and video resources. Check out YoMIND’s resource portal, scroll down to see a music video and mindfulness practice videos featuring JusTme and keep on reading to see how you can make a difference for YoMIND! The 'YoMIND is KIND' Agreement is an agreement we are asking students, parents and teachers to make. This agreement recognizes that kindness is our natural state of mind and that we can support each other and our mental health through encouraging the practice of yoga and mindfulness. Kindness to self and others is much needed in schools, homes and communities. 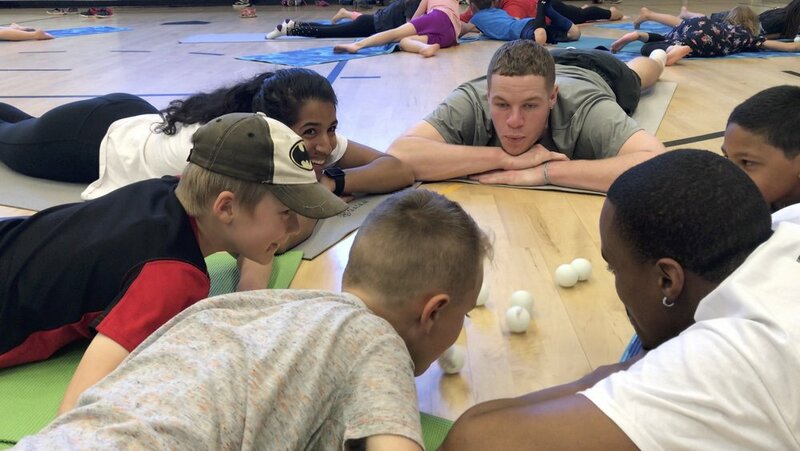 Here is SOU student athlete, Lauren McGowne, and graduate student working out the details for the YoMIND is KIND agreement with a third grade class from Bellview Elementary in Ashland, Oregon. Please take the agreement and pass it on!! 'YoMIND is KIND' Playshops are Here! Playshops at Bellview Elementary in Ashland, Oregon with Southern Oregon University Athletes. "YoMIND is KIND" playshops at Roger Bryan Elementary in Las Vegas, Nevada! Contact us HERE to have Libby visit your school. Testimonials and more photos of 'YoMIND is KIND' Playshops coming soon! YoMIND is dedicated to bringing high quality audio and video resources to communities. The Ashland Schools Foundation acts as our fiscal sponsor for these efforts. To make a tax deductible contribution, go to Ashland Schools Foundation website and be sure to write in the comments that you would like your contribution to go towards "YoMIND Video Production". Thank you in advance for your support and for checking out our website. We are happy to share our video collaboration with JusTme, hip hop artist & mindfulness/yoga instructor. Last summer the YoMIND team headed to the Las Vegas desert to film a music video for JusTme's new single, "I'm Inspired". We also filmed a series of 7 short mindfulness exercises for all ages that can be used in the classroom or at home. And the best news is...these videos are FREE for everyone! We encourage you to share the videos on social media and use them whenever you need a moment to relax yo'mind. If you are a teacher or school administrator, please consider using them in the classroom to give you and your students a short 'brain break' during the day (research here on why this works!). If you would like JusTme to visit your school or have him provide a virtual "Classroom Kick-it", go to JusTmindfulness.com to learn more. Music Video for "I'm Inspired", the new single from JusTme -- hip hop artist & mindfulness/yoga instructor. 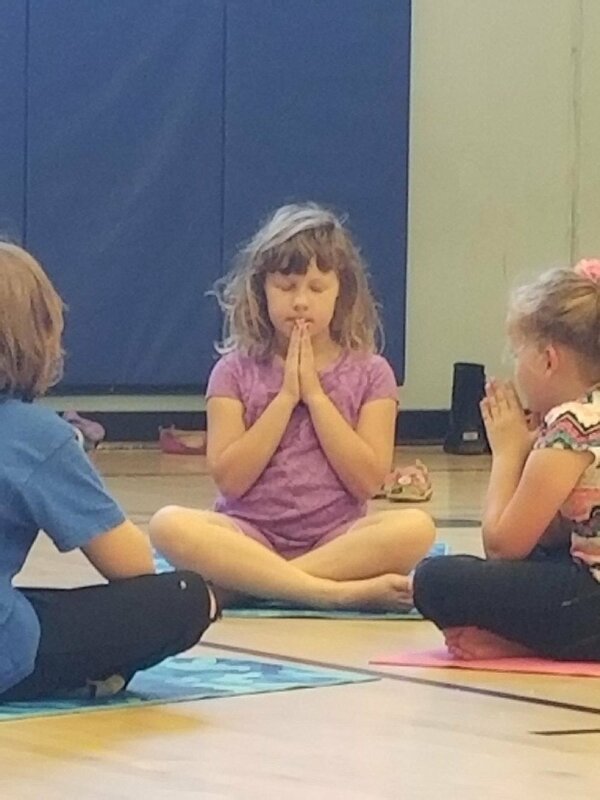 The first in a series of 7 short mindfulness exercises led by JusTme, with K-6 students in mind. Behind the Scenes with JusTme and YoMIND when they visited Roger Bryan Elementary in Las Vegas, Nevada and filmed JusTme's music video, "I'm Inspired". 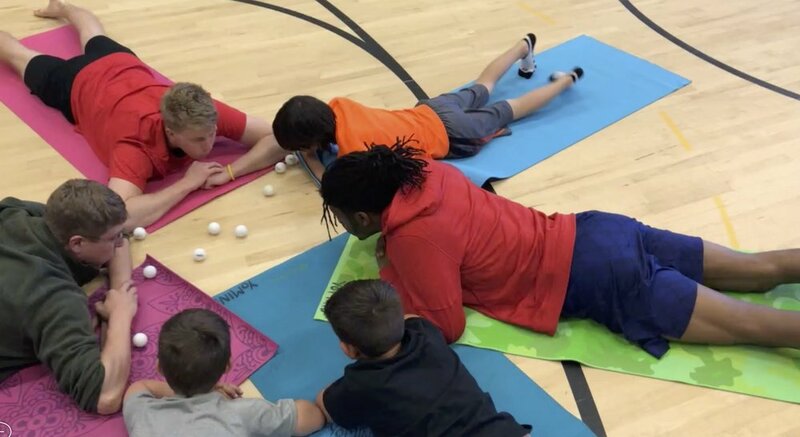 Check out the "Movement Sequences" section of our resource portal to access new yoga videos with YoMIND Instructors Libby Edson, Matthew Downard and Caitlin Dunnington and with JusTme. We will be adding more videos over the next few weeks for all levels of practitioners. Check out our new yoga videos HERE! 1. Watch the videos with your students, co-workers and friends. 2. Share the videos on social media. 3. Bring JusTme to your school for a live performance or a virtual "Classroom Kick it". 4. Contact Libby about an Optimize YoMIND workshop for your staff, a YoMIND Athlete workshop for yo' team, or demo class for your students/staff. 5. If you are a teacher, play the videos in your classroom. 6. Make a tax deductible donation through the Ashland Schools Foundation to help us to create more resources! Be sure to write "YoMIND Video Production" in the comments. 6. Email Us about more ways to collaborate! 7. Most importantly, remember kindness is a superpower, choose love always, and take care of yo'mind! YoMIND is encouraging communities to provide YoMIND classes for their first responders. It would be hard to argue that the mental and physical health of our first responders (police, firemen, EMTs, nurses, doctors, teachers, etc) is not a number one priority for or every community. YoMIND is encouraging schools, city, state, and national governmental agencies to consider investing in YoMIND and the well being of their employees. Check out these photos from our YoMIND/Ashland Police Department Pilot Program. If you would like to bring YoMIND to your local heroes, contact us HERE for on site classes, or consider donating to the YoMIND Video Production Fund through the Ashland Schools Foundation. Be sure to write "YoMIND Video Production" in the comments so the funds will be directed our way. Testimonials and photos coming soon! Having trouble accessing our media resources at home or in your school?